Tuesday was a big day for Gannon University athletics as Lisa Goddard McGuirk, the school’s director of athletics; Ron Sertz, the executive director of the Erie Sports Commission; and Jacquie Eshleman, the acrobatics and tumbling team’s coach, announced that Gannon will host the 2018 National Collegiate Acrobatics and Tumbling Association Championships in April. Sertz said the process for getting the NCATA Championships to Erie began after the NCAA Conference in February once McGuirk introduced Sertz to the NCAA national director of acrobatics and tumbling, and then earlier this year the Erie Sports Commission bid on the event. “I think the thing [the national director] recognized more than anything is we have the passion to do this and to do it right,” Sertz said. Sertz said the Erie Sports Commission is fully committed to the events they assist and will help with time, providing volunteers, promotions and anything they can do to make the event – and specifically the championships — a success. Along with hosting the NCATA Championships on April 26-28, the team has a new coaching staff. Gannon welcomed Eshleman and assistant coach Alia Nolan to the team this year. Eshleman said it is a great opportunity for the team and the athletes to bring the championships to Gannon. “Lisa assured me through the hiring process not to worry about this, that we will handle everything,” Eshleman said. Last season, the NCATA championships were held at Azusa Pacific University in California, in 2016 Baylor University hosted it and in 2015 Fairmont State University was host. Nancy Post, Baylor’s associate athletic director, said Baylor was able to bring the first television broadcast of the NCATA Championships when it hosted the event. Post said Baylor hosted the event to help support and strengthen the sport of acrobatics and tumbling. “We have a significant fan base, and we were excited to bring this National championship to Waco for them,” she said. Prior to being held at Baylor, the NCATA championships were held at Fairmont State University. However, Gannon did not participate. Chris Thomas of the sports information office at Fairmont State said the school benefited in terms of exposure and broke even when it came to revenue for the university. The sponsorships allowed Fairmont to assist visiting teams with obtaining special rates on hotels and postgame meals. Thomas said the school also sold a sponsorship to help offset the cost of the championship banquet, held the night before competition began. Sertz also believes that hosting the event in Erie, specifically at Gannon, will help the university down the road. “Anytime you have a program that hosts a national championship and a city that hosts a national championship, it gives a program a little cache with parents and prospective student-athletes,” Sertz said. 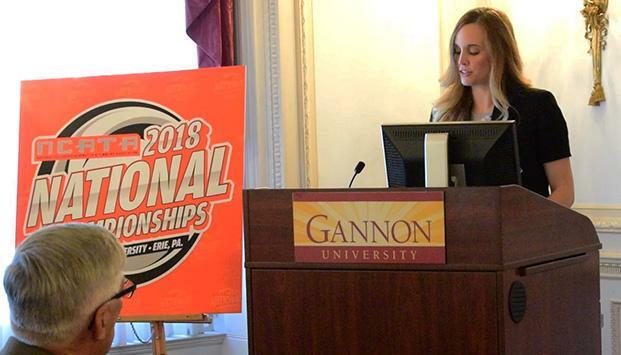 Sertz also gave accolades to Gannon’s program, coach and facilities for being reputable, and he thinks hosting the championships will give the university an edge in recruiting. Senior Michaela Soper thinks the new coaches have been a great addition to the program, and both are such role models for the athletes, providing positivity and passion and driving the team not to disappoint. “I am especially excited for this season as we host our first ever NCATA National Championship,” Soper said “Their continuous support and belief that we are good enough will carry us to nationals and be a driving force behind out success. As the acrobatics and tumbling team prepares for the season, Eshleman hopes to instill mental toughness as a team while creating bonds, and credits Campus Ministry and the volleyball team for help with a retreat to grow closer as a team. She also hopes people will support the team throughout the year and the sport will continue to grow. “I just love this sport — I’m very passionate about it and it’s just amazing to see athletes have this opportunity in college,” she said. Video shot and compiled by BRITTINY LENE, rafferty004@knights.gannon.edu.